When Al Spoto, accordionist and founding member of The Acoustics called we surprised ourselves by talking for half an hour. When I found out that Spoto was going to be taking his accordion into some local primary school classrooms to introduce his music to the children, things got interesting very quickly and I couldn’t let him go. He was excited about volunteering with An Instrument For Every Child, the local organization that promotes and provides instrumental music education in schools. The Acoustics band has been around for about ten years, and continues to grow in experience and repertoire. They are a lively band playing their own original folk/rock, world/roots music. Members are Alfonso Spoto (accordion), Enzo Spoto (acoustic guitar), Richard Hone (drums/percussion, graduate of Humber College music program), Bonnie Krenciglowa (violin, former Concert Mistress and soloist with the East Hamilton Strings and itinerant strings instructor with public school board), and Andrew Eckart (double bass, graduate of Westmount S.S. music program). Erie Long is an evolution of new musical styles featuring vocals and instrumental original compositions. Unlike their previous two albums that featured all world/roots instrumental music, Erie Long features more contemporary folk/rock lyrical songwriting, and was recorded over a three year period at Grant Avenue Studio. Amy King was the sound engineer and also provided some backing vocals. In November 2012 The Acoustics released their first digital single Christmas Every Day. This was a Design Hope Project, with all proceeds from sales going to the Hamilton Out of the Cold program.. The band was first recognized for its musical achievements in 2004, when A Thousand Yesterdays was the winner of the Hamilton Music Award for Best Instrumental Recording of the Year. Forever and A Day was named Folk/Traditional recording of the year at the 2008 Hamilton Music Awards. Forever and a Day recently won second place for World Album of the year at the 2009 Just Plain Folk Music Awards in Nashville, Tennessee. Subsequently, the album was nominated for two 2009 Hamilton Music Awards: Folk/Traditional Recording of the year and Instrumental Recording of the year. Spoto’s connection with An Instrument For Every Child came about when director Astrid Hepner’s husband Darcy played on the Acoustics’ most recent album. Spoto will be demonstrating accordion and chatting with grade one students at Cathy Wever School, Memorial, Dr. J. Edgar Davey, Holy Name of Jesus, and Prince of Wales. It’s just another way of connecting with the community and create a positive context for music performance. “We do all of this because we love writing music and sharing it with the general public. I’ve been playing accordion since I was eleven. Everyone thinks accordions are just for polkas, but over the years I’ve tried to develop my own style and sound,” says Spoto. The need to make a good quality video is on Spoto’s mind as we chat, “At some point down the road I’d like to do a video, but now all of our funds go to making good audio recordings.” Naturally, The Acoustics are pursuing regular live performances. They like to be on stage at least once a month. 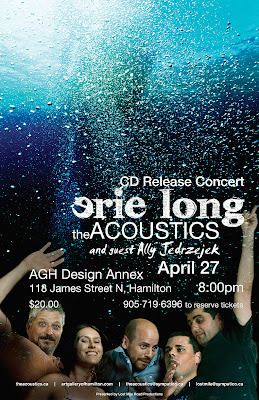 The Acoustics release party for Erie Long is planned for Saturday, April 27 at the AGH Design Annex at 118 James Street North. Tickets are $20. Phone 905-719-6396 for reservations.